Hungarian Daniel Lukacs, who won a recent online satellite tournament at Intertops Poker, will be playing in the $500K GTD PPC Aruba World Poker Championship in November -- and so will three more online poker tournament champions. Intertops Poker and Juicy StakesPoker are hosting three satellite tournament series this summer, each awarding a $5000 prize package. Daily satellites begin July 25th, culminating in the next Final Table July 31st. Next month there will be two more series, August 8 – 14 and August 22 – 28, and two more winners. 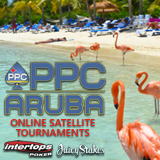 PPC Aruba satellite champions receive $5000 prize packages that include $2400 buy-in to the Main Event (November 4th – 7th) and accommodation on Palm Beach at the Hilton or Hyatt Resort. Both packages also include travel expenses, one $200 tournament buy-in and one $300 buy-in, as well as Intertops or Juicy Stakes gear and dinner and a night out with the Intertops or Juicy Stakes team. Vincent Fiorenza won the 2015 PPC Aruba Main Event taking home $106,047 of the $500,000 GTD prize pool. The tournament organisers also gave him a $5000 prize package for this year so he'll be returning to Aruba to defend his title. Daily online satellites continue until August 28th. These are three-tier tournament series. Players can buy in at any stage or try to win their way to the Finals. Register via the Tournaments tab in either poker room. Winners of previous online satellite tournaments have shared their poker adventures abroad on my Living the Dream poker blog.